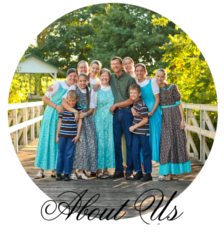 The Bible I have is 9 1/2″ long x 7″ wide x 2″ thick.� It also pretty comfortably fits my sisters’ Bibles that are 9″ long x 5� 3/4″ wide x 1 1/2″ thick. 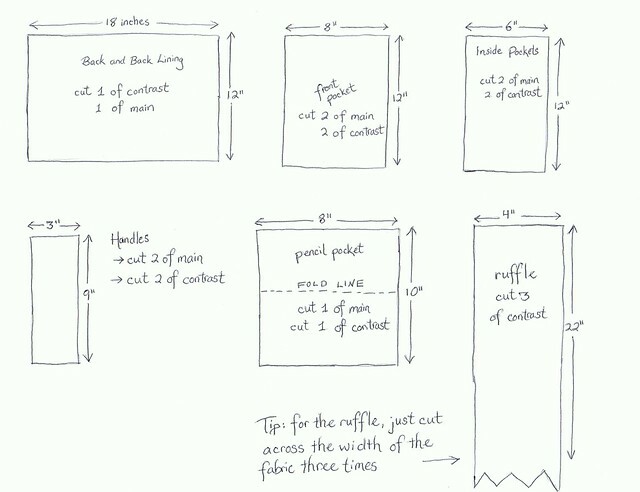 Cut out the material as directed below.� If you are having trouble seeing the pattern, click here to print it off. 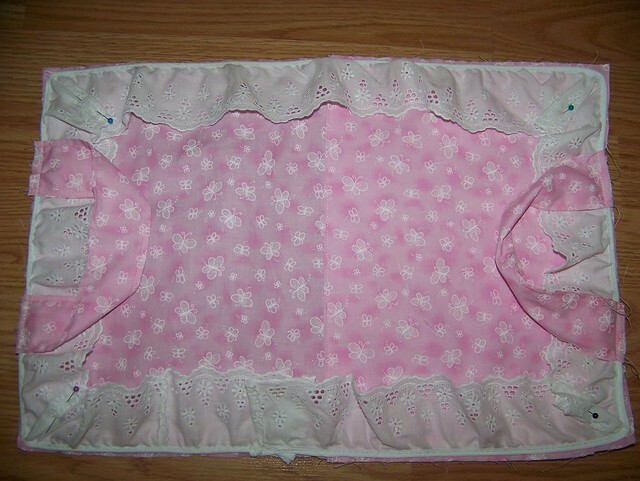 Ruffle: same as for reversible, unless you’re doing lace, then just skip this. 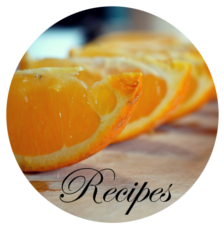 Please note that the�directions for cutting certain ones out of the ‘main’ or ‘contrast’ are only suggestions. You can mix it up however you like 🙂 You may have noticed that I didn’t make the ruffle contrasting in my Bible cover in the top picture. Just be sure to adjust how much of each material you get! Take your two pocket pieces and put them right sides together. 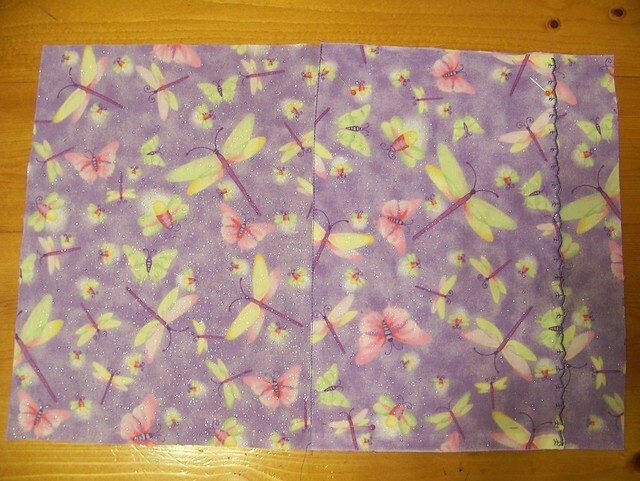 Stitch a 3/8 inch seam along both long sides. Turn and press. Fold your back piece in half to find the midpoint. 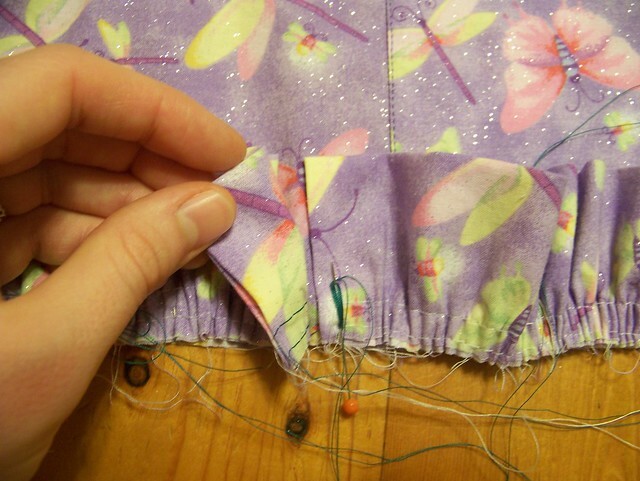 Line up your front pocket with the midpoint and topstitch it down. 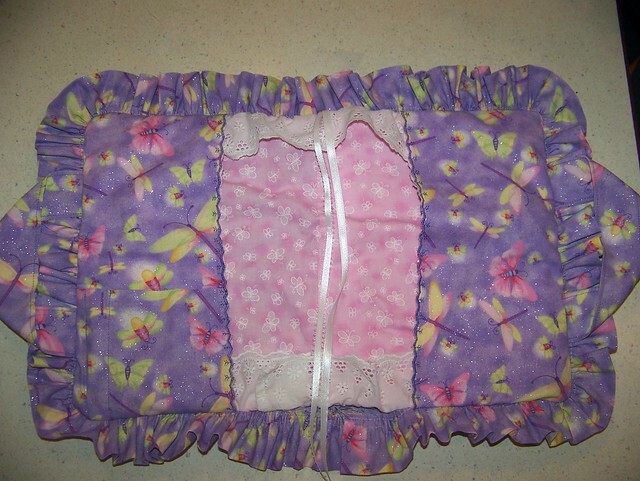 I don’t have this pictured, but baste across the top and bottom of the front pocket to keep it in place. 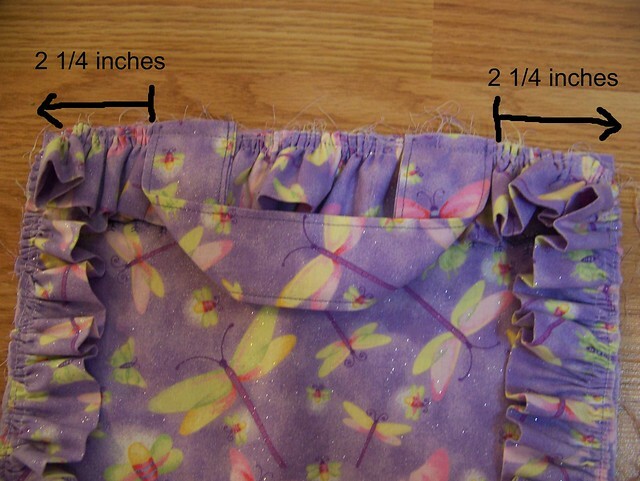 Take your three ruffle pieces and sew them together with a 1/2 inch seam, so that you now have one straight and long ruffle piece. Press the seams open. 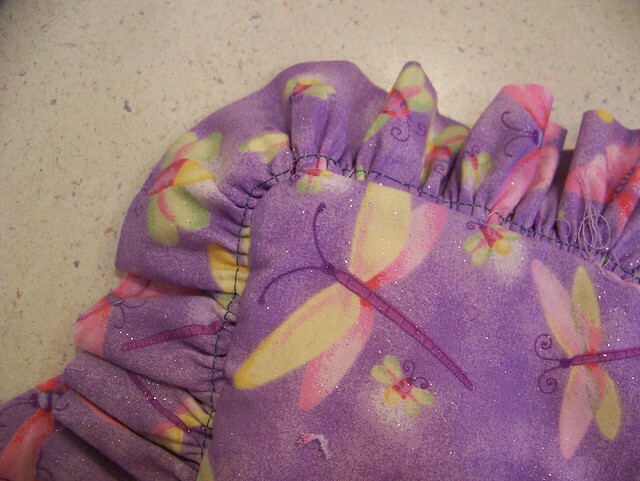 Fold the ruffle in half and press it with a hot iron. Then take the edges and press them inside about 1/2 inch (as shown below) so that the raw edges are now inside. You can stitch across the ends if you’d like, to keep it from fraying whenever you wash it, however, if they are the selvege edges, you don’t have to worry about stitching across it. 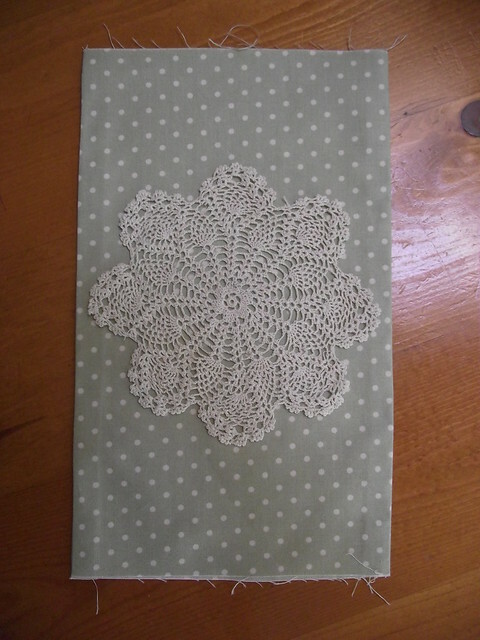 If you are doing lace, you pin and baste it on much the same way. 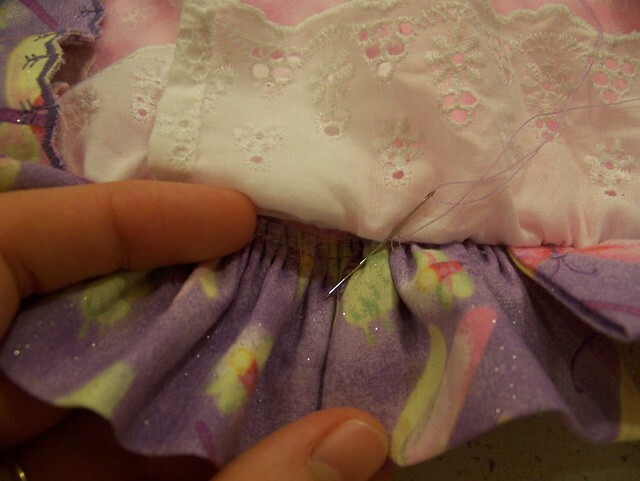 Pin the right side of the lace down to the right side of the fabric. Just make sure that you fold the ends of the lace so that the raw edges won’t show. I often “hem” the edge of the lace to keep it from fraying when it gets washed. 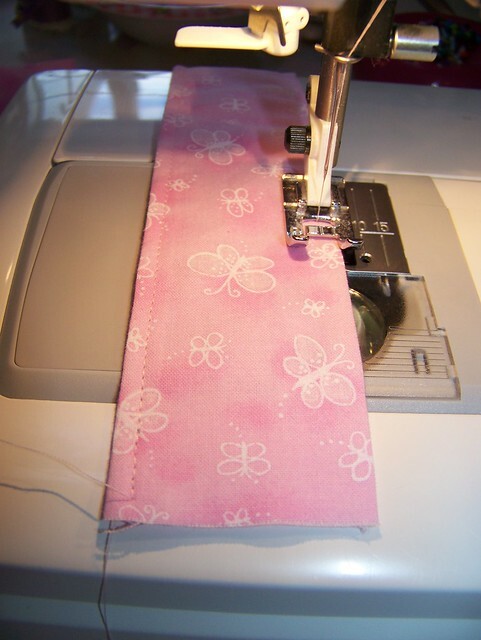 Fold your handles right sides together and sew along the long raw edge with a 3/8 seam. Turn and press. Top stitch along both raw edges. Baste your handles to the short sides of the back, 2 1/4 inches from the top and bottom as shown. If you are doing a reversible Bible cover, repeat this for the other side. 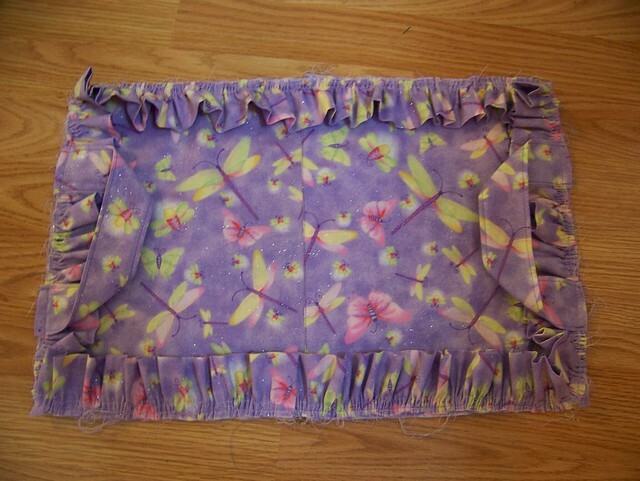 Only I don’t recommend doing a ruffle on both sides. 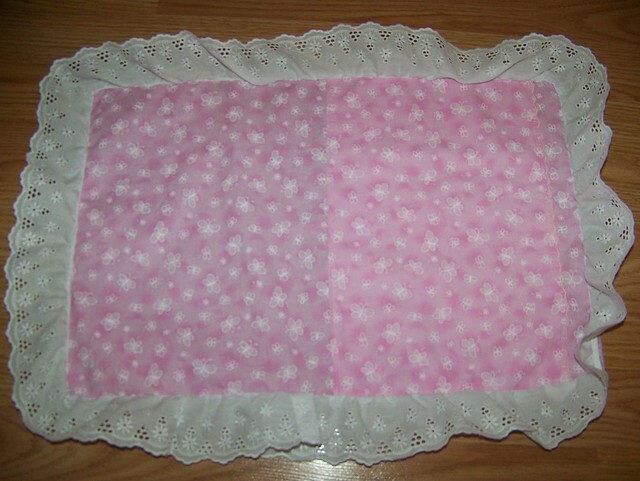 I usually do lace on one side and a ruffle on the other to keep it from getting too bulky. 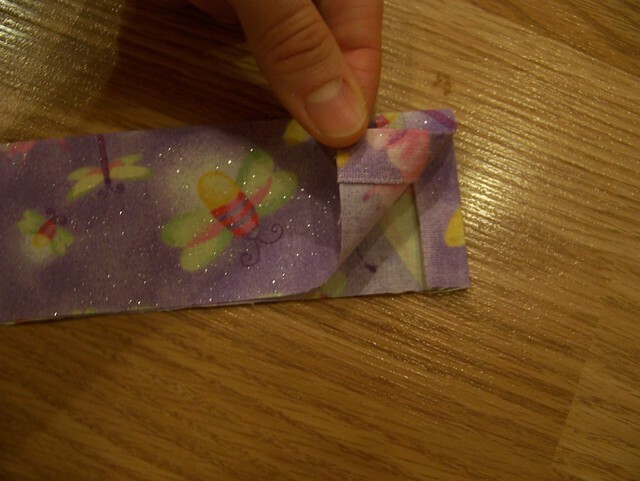 Fold the pencil pocket in half on the fold line, and press. Take one of your Inside Pocket pieces and baste the pencil pocket on the left side of your inside pocket to hold it in place for the next step. Now you can baste the pockets together. 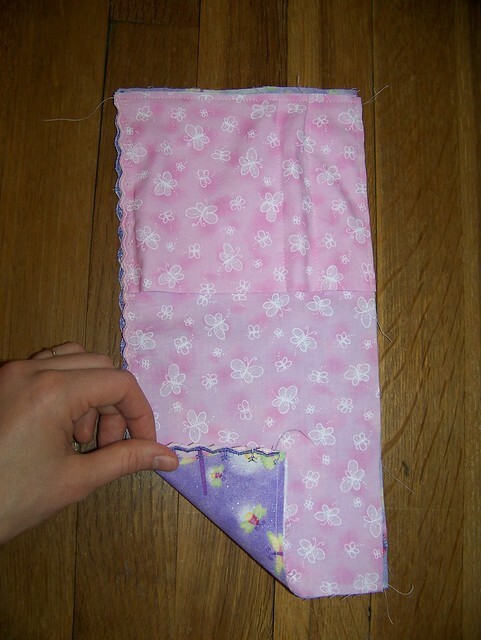 Do a pencil pocket side and a non-pencil-pocket side together, and baste along the three edges as shown. 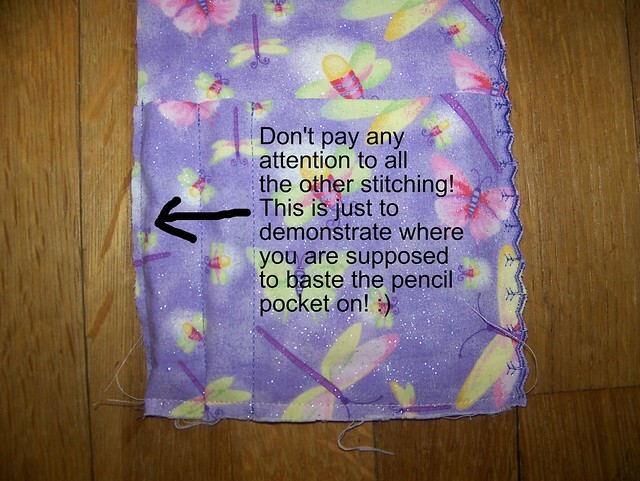 Do the inside and pencil pockets the same way, only do one pencil pocket. Step 5: Putting it together! Now pin the inside pockets as shown. The purple pencil pocket should be facing the purple material, on the right. The pink pencil pocket should be facing you, on the left. Baste around the edges of the pockets. Baste in your ribbons at the top midpoint of the Bible cover. Now, remember the contrasting side you did with the lace? 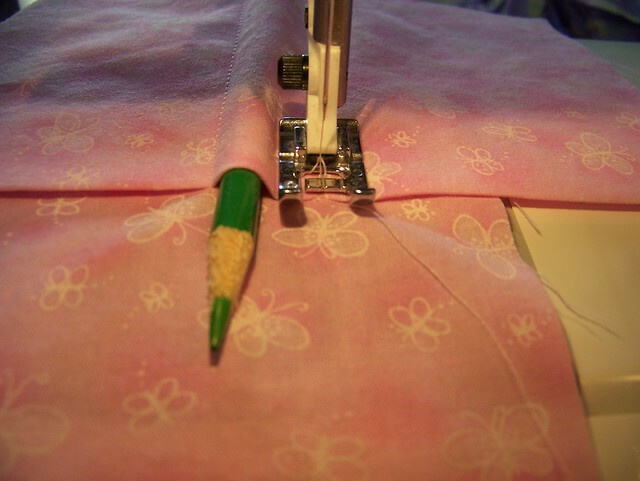 Now�pin the purple Back to the pink Back, right sides together, making sure that the both are right side up! 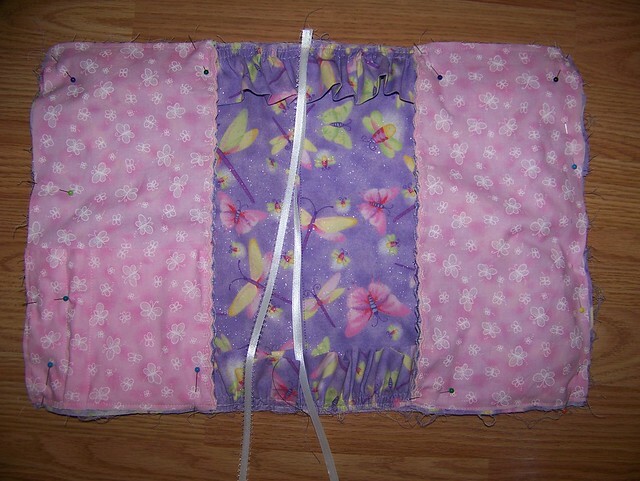 When you are looking at it like in the picture below, your pink front pocket will be on the right, and your purple front pocket will be on the left. Pin it well. 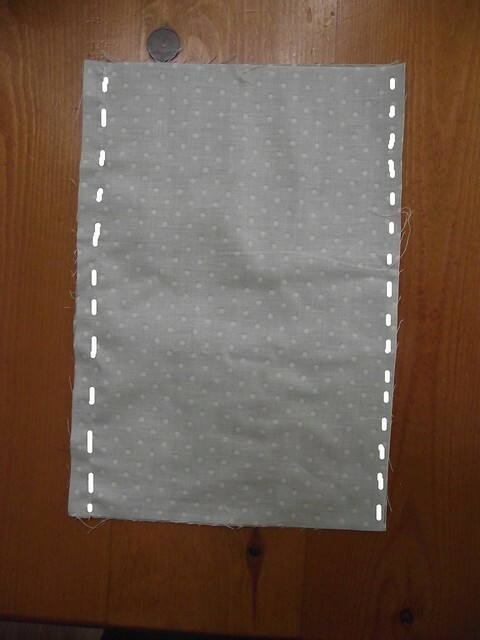 Sew with a 1/2 inch seam allowance all the way around, except for a 5 to 6 inch space on the bottom side. 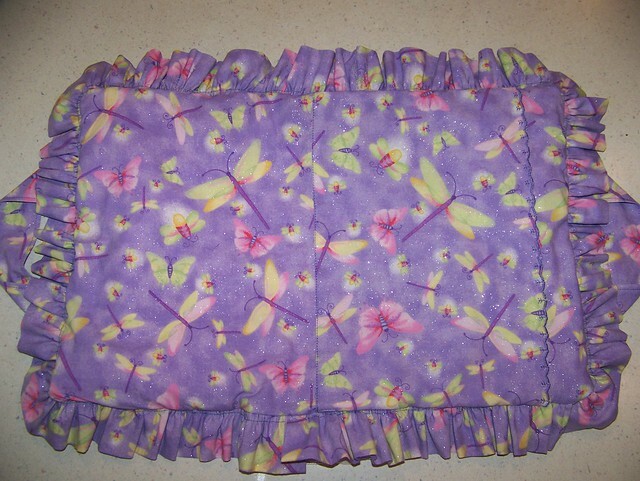 Because the layers are so thick, I sew with a�slightly longer stitch, like about 3.0 instead of the regular 2.5. 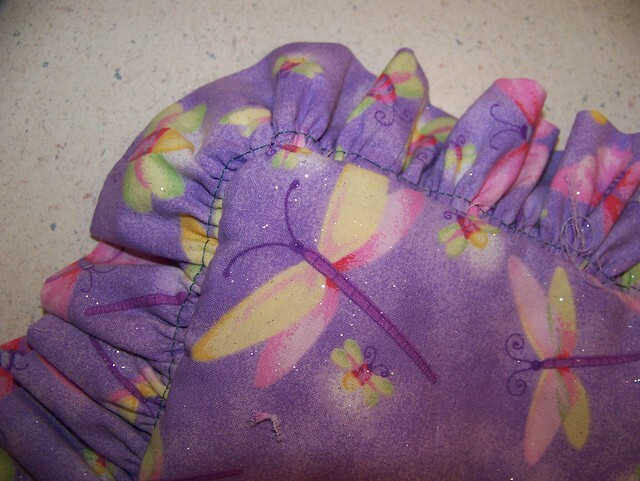 I also like to sew in between my gathering stitches, because it makes a nicer looking ruffle. You have to pull out the stitches that are showing later, so you may or may not want to do this! Just put your Back and Back Lining together the same way. 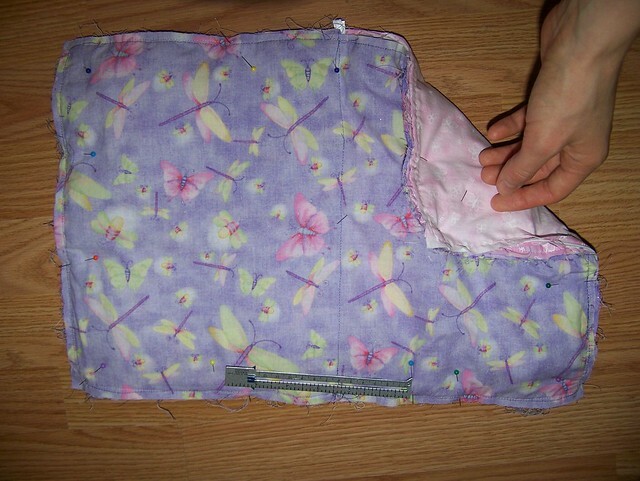 Lay out your Back with the pockets and everything on it, and pin the Back Lining to the top. 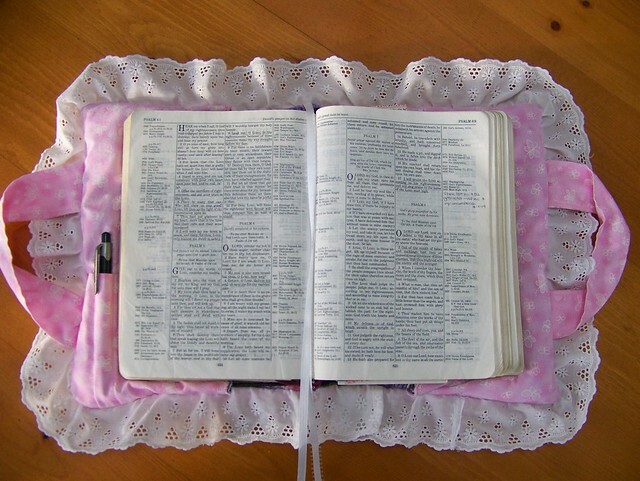 Turn the Bible cover right side out to make sure you didn’t catch in the ruffles or lace, and just go all the way around to double check that you’ve caught everything else in. If you haven’t, go back and take a slightly deeper seam. I also like to check the seam on the inside of the Bible cover, because sometimes it looks like you caught it in on the outside, when really you just barely caught it on the inside. Those places make weak spots, so go over those, too! Turn it back wrong side out, and clip the corners to reduce the bulk. You can also trim the seams a little, but I don’t recommend getting much closer to the seam than 1/2 inch or else it will weaken the seams. Now turn it right side out again. 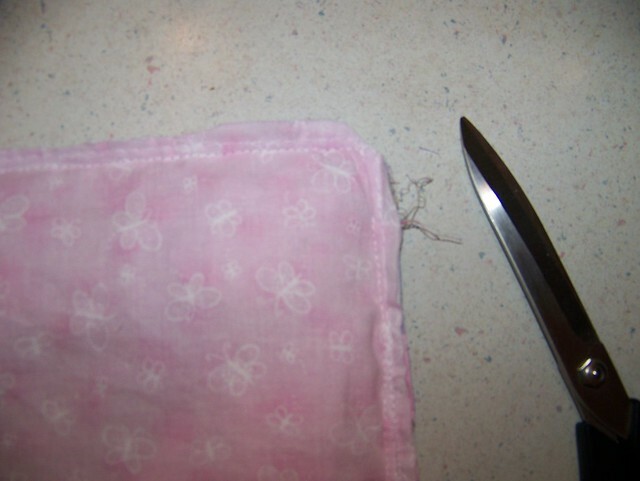 If there are any gathering stitches showing, use a seam ripper to pick or pull them out. Sometimes when you break the thread underneath, you can pull part of the thread out on top more easily(and vice versa) without having to sit and pick out every single stitch. 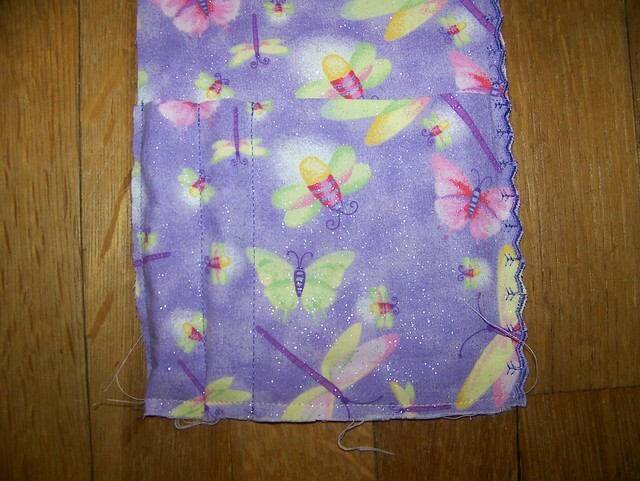 Then I hand-stitched it closed, just using a small ‘back and forth’ stitch, so that the stitches would be pretty hidden. 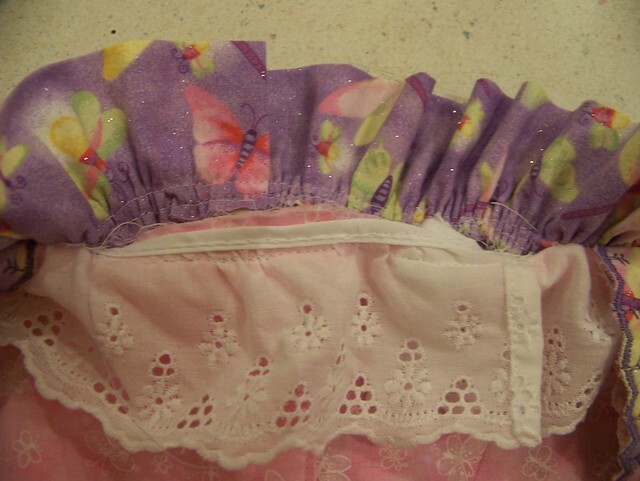 They’ll be hidden pretty well anyways, since the lace and ruffles are so full! You are free to make these Bible covers to sell in homemade shops, such as Etsy, but please do not take or sell this pattern as your own. Thanks! Lol! 😀 Let me know how it goes! That is beautiful! 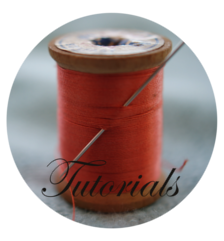 Wonderful tutorial! You are gifted! What a lovely Bible cover! 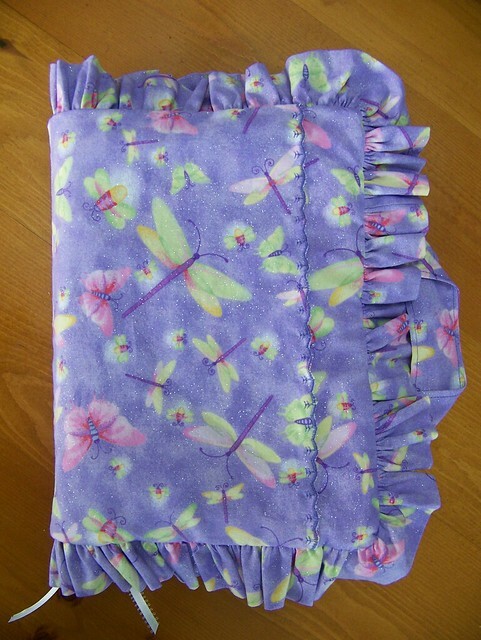 How blessed you girls are that you learned to sew and are so talented at it! I have a brand new sewing machine in a box but no one to teach me! 🙁 I wish I lived closer! 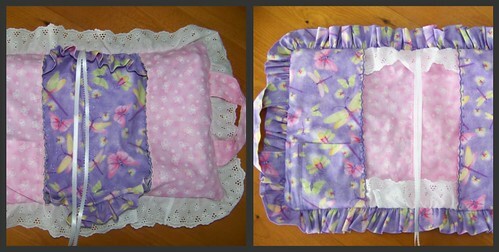 You could come over for tea and give me sewing lessons! What a grand time we’d have! P.S. I voted for you all in a million categories today for the awards! 🙂 HUGS! Thank you, Jessica. Can’t wait to show it A!!! Give my love to the family! Oops! I forgot to mention anything about size on there! I just updated it, so the answer to your question is close to the top under “Measurements” 😀 Thanks for bringing that up! 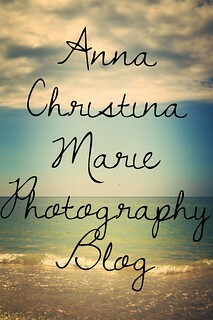 I have been reading your blog for some time now and I realy enjoy all your story’s and pictures! 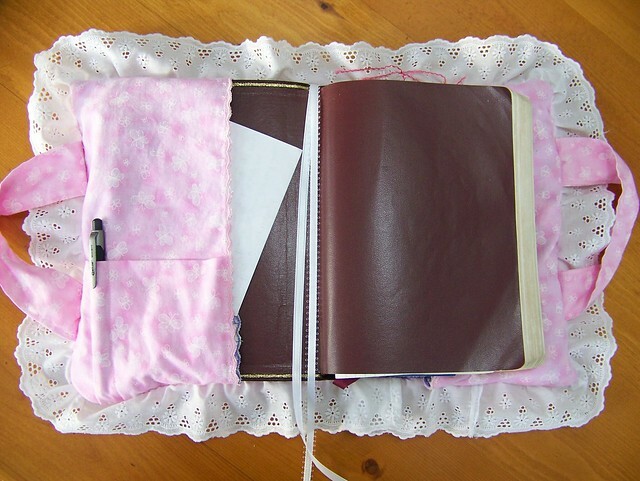 This is a lovely tutorial and I am thinking of making one, not only for my bible, but maybe also for my diary and my housekeeping journal. Thank you for sharing! Greetings from the Netherlands, Mama lieveheersbeestje. What a beautiful tutorial, ladies! I love the sweetness of it! These would make such fun gifts for friends! 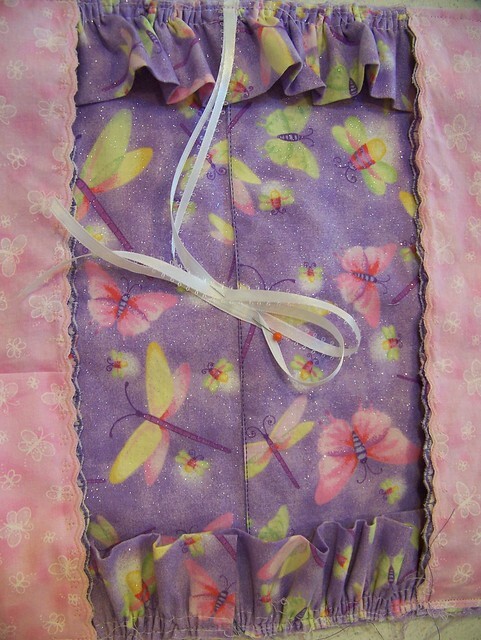 Thank you for sharing your gift of sewing with us! 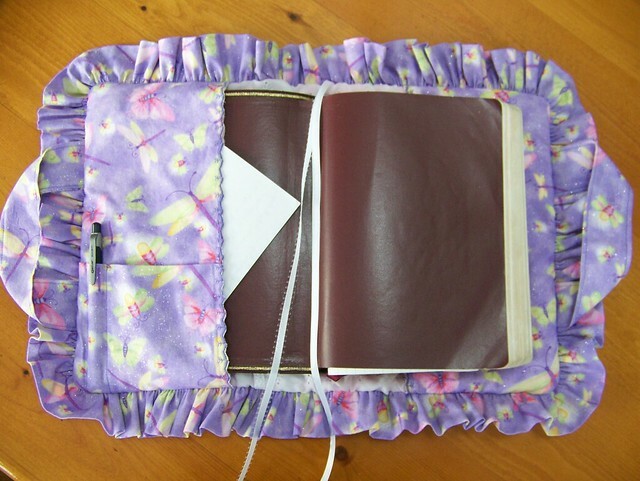 I tried this Bible cover myself and worked out very well! I really love it!! It has lots of pockets (which I need), fits my Bible well (always a bonus 😉 ), and I really like the material I used. Thanks so much! It was wonderful. 🙂 I did post a few pictures on my blog so if you’d like to see them you can. they are so pretty! I like the ruffles on them! 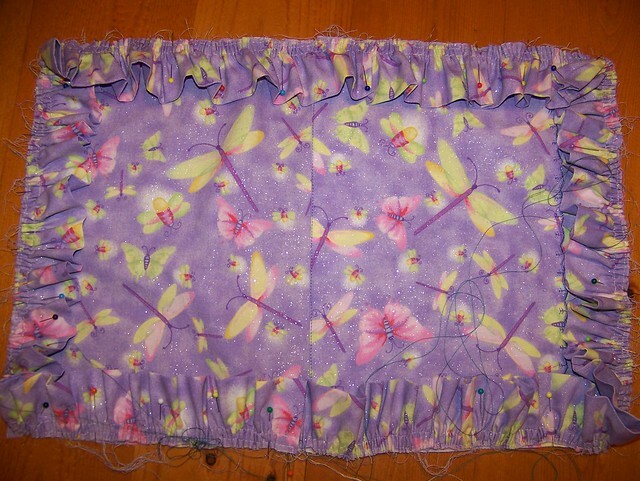 I’m currently working on a skirt, and I LOVE your harp playing!! Hi Jessica, Hey how much would you charge to make me a new cover like this for my new Bible 🙂 ? Hi Lori! I made this for my Bible which measures 9 1/2″ long x 7″ wide x 2″ thick. It also pretty comfortably fits my sisters’ Bibles that are 9″ long x 5 3/4″ wide x 1 1/2″ thick. Hope that helps! 🙂 Happy sewing! I have a quick question! Is there a way to add a pocket the sit atop the flaps and opens the long vertical side? to slide in sermon notes or church papers? I am completely stumped! Yes! You should be able to! I think if you just add another piece of material on top of the flaps, like I did for the reversible cover, that should do the trick!